All the Way is a 2016 American biographical television drama film based on events of the presidency of Lyndon B. Johnson directed by Jay Roach and adapted by Robert Schenkkan from his play with the same title. The film stars Bryan Cranston, who reprises his role as Johnson from the play's 2014 Broadway production, opposite Melissa Leo as First Lady Lady Bird Johnson; Anthony Mackie as Civil Rights Movement leader Martin Luther King Jr.; and Frank Langella as US Senator Richard Russell Jr., from Georgia. The film was broadcast on HBO on Saturday, May 21, 2016. The film was well received by critics, with Cranston's portrayal of Johnson garnering praise. It has been nominated for a Television Critics Association Award for Outstanding Achievement in Movies, Miniseries and Specials, with Cranston also nominated for Individual Achievement in Drama for his work on the film. It was nominated for eight Primetime Emmy Awards, including Outstanding Television Movie as well as acting nominations for Cranston and Leo. Johnson becomes President of the United States after the John F. Kennedy assassination, assisted and advised by his wife Lady Bird. Johnson enters the White House but soon must work on the passage of the Civil Rights Act. Martin Luther King Jr. pressures Johnson to pass the bill without amendments that would defang it; Southern Democrats such as Richard Russell Jr. of Georgia oppose the bill so much that they may abandon the Democratic Party if the bill passes, and Republicans and Democrats on the fence offer amendments opposed by the liberals and the Civil Rights activists. At the same time, Johnson wants to declare a War on Poverty. The Gulf of Tonkin incident causes Johnson to ask Congress for a resolution endorsing a reprisal against North Vietnam, wary of being outflanked on the issue by the Republicans. After successful passage of the Civil Rights Act over a filibuster, Johnson contends for election against Barry Goldwater in the 1964 presidential election. This is complicated by the Freedom Summer movement and pulls between the northern liberal wing and conservative, Southern Dixiecrat wing of the Democratic Party. Johnson assigns J. Edgar Hoover to investigate the murders of Chaney, Goodman, and Schwerner in Mississippi. The state of Mississippi also sends two delegations to the Democratic National Convention in Atlantic City: the "normal" delegation from the Dixiecrat wing, which threatened to walk out on Johnson, and the Mississippi Freedom Democratic Party, a renegade wing supported by the Civil Rights Movement, but vehemently opposed by other Southerners. Johnson, in a bid to save the South, offers the MFDP a compromise that satisfies neither side; the Mississippi delegation walks out, and the MFDP is unhappy with the two at-large delegates offered to them. Johnson hits Goldwater hard in the election, portraying him as a dangerous fanatic who will destroy the world, but is worried. Johnson's aide and friend Walter Jenkins is arrested for "disorderly conduct" after he is found in a tryst with another man in a public restroom; Johnson has an uncomfortable conversation with Hoover on how this fact slipped by security screening. Martin Luther King wins the Nobel Peace Prize; Hoover, still distrusting King, sends him an insulting, anonymous letter demanding King commit suicide, which is ignored. Johnson wins the election conclusively, but the Democratic Party loses the states of the Deep South. Hints of the Vietnam War, the Great Society programs against poverty, the Voting Rights Act of 1965, and the continuing loss of the South to the Republicans are given at the end. Anthony Mackie as Martin Luther King Jr.
Frank Langella as Senator Richard Russell Jr.
On July 16, 2014, it was announced that HBO Films had acquired the rights to the play All the Way with Robert Schenkkan writing the adaptation and Bryan Cranston reprising his role as Lyndon B. Johnson. Schenkkan and producer Steven Spielberg agreed that the adaptation would differ significantly from the play. Schenkkan says, "When Steven, Bryan Cranston and I brought this to HBO, what I said at the time was, 'Look, I have no interest in just shooting the play. What I want to do is a complete cinematic reimagining of this story.' Everybody was on board for that. It's obviously recognizably the same story with many – but not all – of the same characters. I took a really hard look at how I could best tell this story on screen now that I had all the things that cinema brings that I did not have in my toolkit when I was working on stage." On March 7, 2015, it was announced that Jay Roach would direct the film. On June 30, 2015, Anthony Mackie was cast as Martin Luther King Jr. On July 2, 2015, Melissa Leo was cast as Lady Bird Johnson. On July 8, 2015, Stephen Root and Marque Richardson were cast as J. Edgar Hoover and Bob Moses, respectively. On July 23, 2015, Bradley Whitford was cast as Hubert Humphrey. On July 23, 2015, Aisha Hinds, Spencer Garrett, Todd Weeks, and Mo McRae were cast as Fannie Lou Hamer, Walter Reuther, Walter Jenkins, and Stokely Carmichael, respectively. On July 28, 2015, Frank Langella was cast as Richard Russell Jr. On September 18, 2015, Bruce Nozick was cast as Stanley Levison. On September 29, 2015, Ned Van Zandt was cast as J. William Fulbright. All the Way received positive reviews from critics. The review aggregator website Rotten Tomatoes gave the film an approval rating of 88%, based on 25 reviews, with an average rating of 8.1/10. The site's critical consensus reads, "Anchored by Bryan Cranston's phenomenal performance as LBJ, All the Way is an engrossing portrayal of a complicated man during a pivotal moment in US history." On Metacritic the film has a score of 78 out of 100, based on 27 critics, indicating "generally favorable reviews". ^ "HBO's Adaptation of ALL THE WAY, Filmed 'LADY DAY' Receive Premiere Dates". Broadway World. January 7, 2016. ^ Clement, Olivia (July 14, 2016). "Audra McDonald, Viola Davis, Bryan Cranston Among 2016 Emmy Nominees". Playbill. ^ Andreeva, Nellie (July 16, 2014). "HBO Films Nabs Adaptation of LBJ Play 'All the Way' with Bryan Cranston Starring & Steven Spielberg Producing". Deadline Hollywood. ^ McKittrick, Christopher (October 4, 2016). "Chopping in High Cotton: Robert Schenkkan on All the Way and Hacksaw Ridge". Creative Screenwriting. ^ Siegel, Tatiana (March 7, 2015). "Jay Roach Attached to Direct HBO's LBJ Biopic 'All the Way' (Exclusive)". The Hollywood Reporter. ^ Fleming, Mike (June 30, 2015). "Anthony Mackie To Play MLK Opposite Bryan's Cranston's LBJ In HBO's 'All the Way'". Deadline Hollywood. ^ Andreeva, Nellie (July 2, 2015). "Melissa Leo To Play Lady Bird Johnson In HBO's LBJ Movie 'All the Way'". Deadline Hollywood. ^ Petski, Denise (July 8, 2015). "Stephen Root & Marque Richardson Join HBO's LBJ Movie 'All the Way'". Deadline Hollywood. ^ Petski, Denise (July 23, 2015). "Bradley Whitford To Play Hubert Humphrey In HBO's 'All the Way'". Deadline Hollywood. ^ Petski, Denise (July 23, 2015). "HBO's LBJ Movie 'All the Way' Adds Four To Cast". Deadline Hollywood. ^ Petski, Denise (July 28, 2015). "Frank Langella To Co-Star In HBO's LBJ Movie 'All the Way'". Deadline Hollywood. ^ Lincoln, Ross A. (September 18, 2015). "Bruce Nozick Joins 'All the Way', Ernie Hudson Returns For 'Grace And Frankie' Season 2". Deadline Hollywood. ^ Busch, Anita (September 29, 2015). "Ned Van Zandt Cast In LBJ Pic 'All the Way'; Two Join Indie YA Adaptation 'Measure of a Man'". Deadline Hollywood. ^ Lesnick, Silas (August 13, 2015). "HBO Goes All the Way with Bryan Cranston". Comingsoon.net. 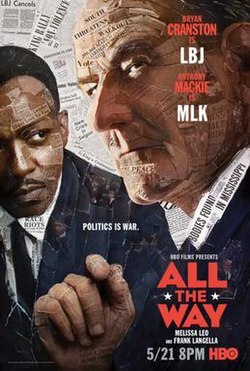 ^ "All the Way (2016)". Rotten Tomatoes. Retrieved May 26, 2016. ^ "All the Way". Metacritic. Retrieved May 26, 2016. ^ Patten, Dominic (May 24, 2016). "HBO's 'All the Way' Tops 'Confirmation' In Total Viewers But Not 'Bessie'". Dateline: Hollywood. Penske Business Media, LLC. Retrieved October 28, 2017.